Exient grooves down the mountain with the best snowboarding game for iPhone. Snowboarding is at an all-time high, especially following Shaun White's unbelievable run at the Olympics last week. The folks at Exient, the makers of X2 Soccer 2010, are aware of this, and produced a quality portable game that you should check out if you own an iPhone or iPod Touch. Despite the generic name, X2 Snowboarding means business. You start the game by selecting from various "extreme" riders who vary in performance. Some are better when it comes to board handling and tricks, while others are perfect if you're in the mood for speed runs. Once you've made your selection, you'll choose from one of six mountains, taking advantage of trick opportunities and pushing both your score and boost power to the maximum. What's great about X2 Snowboarding is that it doesn't try to hammer a complex control scheme down your gullet, like Shaun White Snowboarding: Origins. There's a swiping option, where you guide your rider in different directions by touching points on screen. If you're looking for the simplest gameplay option, however, you'll definitely want to go with tilt handling. Here, you'll lean your device left and right to steer, while maneuvering it upward to accelerate and back to brake (so you don't ram into a wall). To get air, you'll either initiate a manual jump (by hitting a button in the left corner of the screen) or come off a ramp. Once you're airborne, the game's astonishing trick system goes into effect. Instead of cramming all your moves onto one board, you have two, each with their own grabs and kicks. All you need to do is tap one (or more, if you want to build a combo), then swivel your iPod Touch/iPhone around for spins and flips. In addition, if you screw up some tricks, you have sufficient room for improvement. X2 Snowboarding includes time rewind and slowdown options, both of which are practical over the course of the game. Rewind helps you erase a pitiful mistake so you can try again, while time slowdown enables you to nail precision movements to carry out tricks you couldn't do otherwise. They're both novel additions to an already enjoyable game. Not only does X2 Snowboarding have the gameplay right, but the presentation is slick as well. The cel-shaded graphics reminded us an awful lot of Jet Grind Radio's art style, but without the over-the-top graffiti and costumes. The game moves very smoothly, even through the mountain's rougher terrain, and the menus are easy to navigate. The in-game music is pretty good, but Exient goes the extra mile by including an option to play your own in the background. The sound effects are OK, although some of the noises, particularly the rail grinding and the constant chatter from your boarder, are too loud. With six mountains to snowboard across, X2 gives you a lot to do on your own. However, if you want some competition, the game supports both Bluetooth and local multiplayer, should you find someone else that owns the game. Online multiplayer is absent, but there's always the chance Exient will add it later through a patch. The game does have an initial price tag of $6.99, and it's definitely worth that. However, if you're still unsure, look for a free X2 Snowboarding School app. It'll give you a chance to try out the game on a sample course and see what it's about. After the first run, though, we feel that you'll enjoy it enough to invest in the full game. 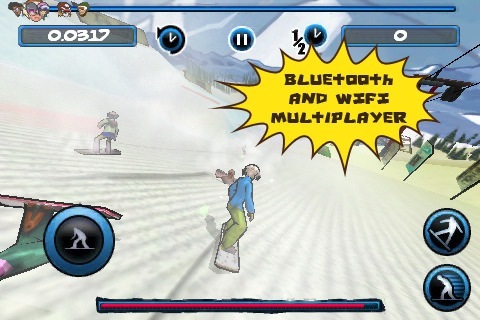 Kudos to Exient for making snowboarding fun again on the iPhone. After struggling for the longest time with Shaun White, X2 Snowboarding snags the gold medal, thanks to its exhilarating gameplay and admirable presentation. It's a little costly and doesn't have online competition, but you'll find this powder run worth purchasing. What's Hot: Plays better than previous iPhone snowboarding games, cel-shaded graphics give the game a trendy look, local and Bluetooth multiplayer, rewind and slowdown options help you master tricks, various boarders to choose from. What's Not: No online multiplayer, rail-grinding noises are a bit loud.